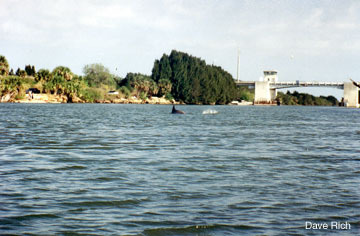 Located on the narrowest part of Merritt Island, the Old Haulover Canal linked the Mosquito Lagoon on the east with the Indian River on the west. In 1854, the federal government spent $5,000 to construct the canal based upon an investigation by Lieutenant Wright. The canal was located at this point as it served as a traditional crossover point for travel down the inland waterway and, until its construction, cargo was carried across the island and then loaded on boats which continued southward. The canal was 3 feet deep and 10 to 14 feet wide and was constructed by the slaves of a local citrus grower. The Old Haulover Canal was abandoned in 1884 when the new Haulover Canal was constructed nearly a mile to the north. In the 30 years of its use, the Old Haulover Canal served as an important transportation link in Florida's inland water way system.